It’s moving day! It’s bitter sweet. The day started off raining, cold, and windy. To the shock of my father and brothers who kindly volunteered to help me move, I actually had everything packed except for the food in the fridge. Little did they know, late last night I rushed to finish my packing. Last evening I came home from a wonderful date a little buzzed. We drank a whole bottle of red wine at a cozy restaurant called Sambucas in Toronto. We both ordered the same three course dinner, steamed mussels in a curry sauce, slow cooked lamb shanks in a tomato sauce served with vegetables and he had ice cream for dessert and I had crème brulee. The lamb was so wonderful. I wanted to take a picture of it but I didn’t want to come off as a weirdo 😛 I have not eaten a lot of lamb. I don’t come from a lamb eating family. This lamb was fall off the bone, melt in my month delicious! I’m going to try to recreate the recipe or maybe the whole menu. This is not a picture of the meal. 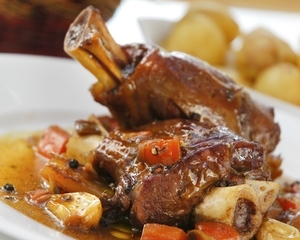 I googled lamb shank and this looked very close to what I ate except mine had a tomato sauce. After I got home I started packing. The moral of the story, don’t pack while buzzed. I ended up packing fewer dishes than what I began with. Also, don’t pack in bare feet it hurts when you step on broken glass!